Edward P. Kohn, editor. A Most Glorious Ride: The Diaries of Theodore Roosevelt, 1877-1886. Albany: SUNY Press. 2014. Pp. 322. Photos, index, glossary. ISBN: 9781438455150. Hardcover, $29.95. On Saturday, April 1 1877, while at Newtonville, Massachusetts, Theodore Roosevelt entered into his diary: “Arvicola riparia. Hesperomys leucopus. Melospiza palustris. Loxia curvirostra. Salamandra. Rana damitans and palustris. Accipter fuscus. Expedition with Russell Hooper.” His entries the following three weeks would also be largely dominated by Latin scientific names for the wildlife he observed. He was only 18 years old. 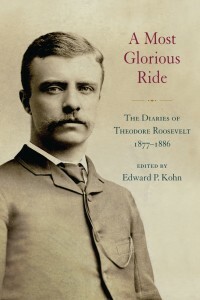 Edward P. Kohn’s publication and editorship of Theodore Roosevelt’s diaries covering 1877-1886 is a significant achievement of American presidential scholarship. Kohn is an Assistant Professor of History and Chair of the Department of American Culture and Literature at Bilkent University in Turkey. His two previous fine books on our only Manhattan-born Chief Executive have established Kohn as an emerging Roosevelt scholar. In this, his latest, volume, he demonstrates his editing skills with great finesse and valuable, but minimal, involvement in the text thereby allowing Roosevelt tell his own story. Young people seldom maintain diaries anymore. The closest modern equivalent are blogs, largely tailored for public consumption. Diaries describe the mundane, the most private feelings, and the daily unfolding of a life. They reflect intimate glimpses of our lives that may never otherwise be recalled if not captured on a page. All of this insight is present in Theodore Roosevelt’s diaries. The young Theodore Roosevelt maintained a fairly consistent diary for most of his transformative years. In these pages, we do not see the polished diplomat or the Rough Rider. Rather, we glimpse a homesick college student, a young man head over heels in love, an ornithologist, a New York society socialite, an unsuccessful law student, a promising – if not precocious — rising politician, and an aspiring naturalist. While many superb biographies of TR have utilized these diaries, this is the first time they have been published in their entirety. To finally have this material available for one of our most important American Presidents is no small achievement, and one long overdue. As a student of Theodore Roosevelt for over 30 years, I was astonished at the insight these chronological diary entries allow into this period of TR’s life that has never been conveyed effectively in the hands of even the most talented biographer. For example, the diaries clearly demonstrate, as no biography has, Roosevelt’s passion for birds. While many biographers have noted this, it truly isn’t apparent until you read Roosevelt’s over 100 entries mentioning birds (by my rough count). Aside from politics and his family, birds were a love that would endure through his entire life. We read in his observations that his ability to identify birds was predominantly by their sound. He would not receive his first pair of glasses till he was a teen-ager and recognition of birds by their song are a recurring event in these diaries. Of course, this insight informs the reader of Roosevelt’s deep personal passion that drove his establishment of the first federal bird refuges while President of the United States. From a sociological perspective, the publication of Roosevelt’s diary would be an important contribution even if the diarist had never become President of the United States. The entries are filled with now vanished glimpses of New York and Boston society life in the Victorian Era coupled with the stark landscape of the Dakota badlands, ranching life in the still dangerous American West, as well as, hunting expeditions in the serenely rugged forests of upstate New York and Maine. These are fascinating juxtapositions of a vanished American life portrayed vividly in the diary entries in a manner that would be the envy of Ralph Lauren. Aside from the historical value and compelling reading of the diaries, Kohn’s editorship is superb. His detailed and valuable endnotes that serve to clarify and contextualize the diaries are an invaluable addition to TR’s own narrative. And, Kohn writes just enough in the biographical summaries to provide insight without crushing the flow of TR’s often minimalist but evocative entries. There is little to criticize with Kohn’s fine effort. Nevertheless, for all of its strength, a fault worth mentioning is that in his written contributions to the volume Kohn does not place these journals in perspective of Roosevelt’s other extant diaries. A lay reader, unfamiliar with the historiography of Theodore Roosevelt, would not be aware that TR was also a regular diarist as a much younger boy. These charming diaries, beginning when TR was 10 years old, were published in 1928 as Theodore Roosevelt’s Diaries of Boyhood and Youth (this book is, however, cited in Kohn’s limited bibliography). While not nearly as important as the period covered by Kohn’s effort, these two volumes should be viewed as complimentary. Roosevelt also maintained a diary while in Cuba during the Spanish-American War and would, infrequently, maintain hunting diaries throughout his life. As he became more aware of his own rising star, Roosevelt began to tailor his own public image in both correspondence and his published writing. So, these youthful diary entries of a young man growing into adulthood are tremendously beneficial to observing the unfiltered development of one of our most captivating American heroes. A Most Glorious Ride is sufficiently illustrated. But, more images of Roosevelt’s diary pages would have been a positive addition. Kohn makes mention of the difficulty in transcribing Roosevelt’s handwriting, ink smears, and Roosevelt’s own habit (certainly maddening to historians) of tearing pages out of his diaries. Yet, to view the written page and all of its deletions and scribbling provide a reader with even further insight into the diarist reflected with the pen on the page. Therefore, it is worth mentioning that the Theodore Roosevelt Center in Dickinson, North Dakota has digitized all of these diaries and placed many of them online at www.theodorerooseveltcenter.org. With editorial skill, Edward Kohn has allowed Theodore Roosevelt to do what no other biographer has been able to accomplish. He adds enough amplification and is wise enough to stay out of Theodore Roosevelt’s way. While there are many gems in these entries, perhaps one of the best is Roosevelt’s entry on Wednesday, July 6 1881 while honeymooning in Europe with his first wife Alice: “Later news says Garfield is not dead. This means work in the future for all men who wish their country well.” Certainly unintentional, but is it not a wonderful stroke of historical foreshadowing? Kohn’s A Glorious Ride allows us the voyeuristic fun of knowing the future while the 20 year old Theodore Roosevelt does not.